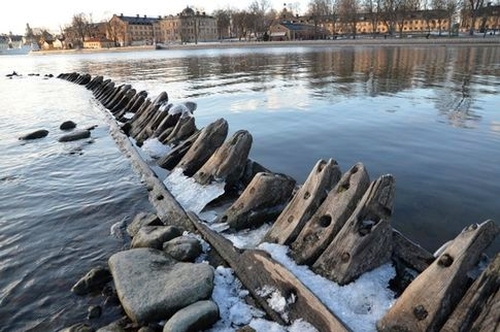 If you find yourself in Stockholm, Sweden, this summer (which lasts roughly 17 days beginning in late June), you may be able to catch a glimpse of a shipwreck from the 1600’s that has recently become visible in the water outside downtown Stockholm. Thought to be of Danish origin, the boat was sunk in the water by the Swedes after successful sea battles to either serve as the foundation for a dock or perhaps as part of a land bridge between the many islands that make up the city. Since then, it — and perhaps many others — has remained mostly underwater and out of sight for hundreds of years until now as historically low water levels (thanks global warming!) have begun to reveal the city’s hidden treasures. In fact, researches in Sweden suspect there may be upwards of 50 such ships in the bay just waiting to be discovered. If you haven’t yet, now’s the time to get your PADI certification and test out your coldwater diving skills — who knows how much longer these artifacts will remain hidden. Here’s another shot of the shipwreck via Flickr user Maria_Globetrotter.